Oh Andrea I am sure you would rather be an Aussie. We may not have that accent but we sure are fun to party with. I saw that pillow a few days ago on her site & thought it was cute too. It does not look hard to make though, so I'd just sew a knock-off & save $175! Looks like i'm following the other opinions and being British wish I was American!! i would be happy to do some swaps with some British magazines, i love the American ones and already have a few subscriptions!! I have always wished I was British. My great-grandparents were, but sadly I never got to meet them. What a great idea about the British magazine swap. I did a swap recently and the girl who sent to me is Swedish and she sent me a magazine and a vintage calender - so fun! I'm with you...if it has "made in Britain" attached to it, I'm in love. I tell my husband all of the time that if he ever got transfered to England (not likely) that it would be just fine with me!!! 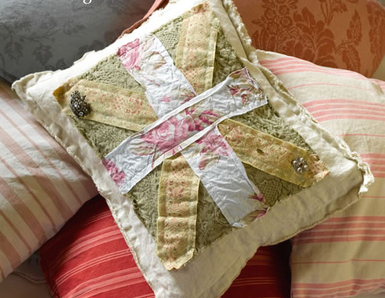 I adore the pillow...I could be in England right now sitting by a fire with pillow underfoot and a cup of tea in my hand! I love that pillow Andrea!! Maybe you could make one like it. I think British accents are so cool! I don't live in London, but my sister does!!! I cannot wait to go in October to visit her and my nieces.. All that cool stuff just waiting to be bought !!!!! Barnes and Noble has a few British publications if you cannot wait!!! i adore nigella and on sunday mornings at 10:30 i dont want to be bothered for the whole half hour,so i can watch her show....i too pretend im british,and when i cook i have a british cooking show,sometimes french but i do a better brit!! I lived in Hannover, Germany a couple of years ago, and the train station book store sold the British Magazines, LOVED THEM!! 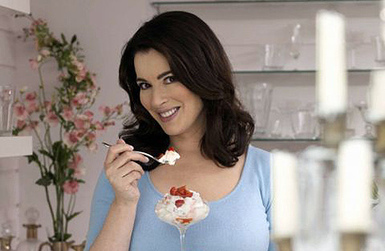 Oh and I love Nigella too!! Okay I fess up too... I dream of being British and living in the English Country Side. Speaking prim and proper like the girls in Sense and Sensibility or Becoming Jane and wearing lovely dresses. Oh to dream. What a wonderful idea about the swap, wouldn't that be so much fun! I hope that you can find someone to do that with and if any one would like to swap with me I would be thrilled!! Please just let me know. WONDERFUL Idea Andrea- thanks for sharing. :) Take Care. Oh, to be British, even for a day! British decorating magazines are a personal "vice" and I pay the premium price for the pleasure at my local bookstore! How fun it would be to make friends with someone from the UK and exchange all American goodies for something from England! Your idea is brilliant! Count me in Andrea and YES I am British, Scottish to be exact. I am also a mag-a-holic and would love, love, to swap mags. Email me with the details when you organise it! 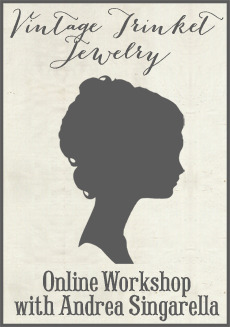 Thanks, loving your blog, sweetie! oh i love Nigella too!!! and anything british...the thought of living in a cute english village would be exciting!! we get british mags over here (australia) and australian mags too - so if you were ever to want to do a magazine swap id be more than happy!! Me too, I always read to my kids in a British accent just for fun. They love it. Did you see the Charlie bit my finger video. So cute and funny. If I weren't just plain old American, I would love to be an Italian! I was a missionary there for a year-and-a-half, and left half of my heart behind me. I plan to take each of my children back for their twelfth birthdays; alone, so I have an excuse to go more often!